Uh Oh! Did Kris Get By With a Little Help From AT&T Friends? 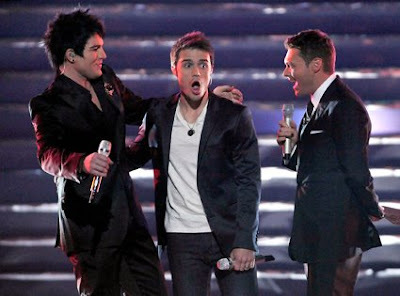 According to The New York Times, the voting that powered our newest American Idol, Kris Allen, to the top may have been woefully askew. Apparently, two Allen parties held on the night of the finals had a few AT&T employees in attendance. In case you forgot, AT&T is one of AI's biggest sponsors. Instead of BYOB, it was Bring Your Own Demo Phones that allow a voter to text exponentially! This "power texting" allowed for 10 votes being cast with just the touch of a button! It seems that the same was not done for Adam Lambert. Fox has yet to comment, but I found this little statement by AT&T to be quite interesting: "In Arkansas, we were invited to attend the local watch parties organized by the community. A few local employees brought a small number of demo phones with them and provided texting tutorials to those who were interested." Hmmm . . . something stinks in Arkansas. What do you all think of this Idol scandal? Now that I'm finally getting content (and even slightly happy with Adam's second place finish), they spring this on me. Ay-yi-yi! Will it ever end? And will we be seeing Kris' "O" face for the fourteenth-millionth time when he is dethroned? Nah, that will never happen. But it should be quite interesting to see what transpires next. I'm sure that didn't even make much of a dent in the results if any. I have heard that the margin of votes between Kris & Adam wasn't even close. Time to move on. Kris is the American Idol. people to cast 38 million votes!!!!???? Idol Arkansas STOLE it from Adam!!!! I dont think this stuff should be swept under the rug and say that it was insignificant. Between ATT and Krisallenations encouraging Kris Allen fans to download computer software so they can super vote, we now have a mediocre American Idol who probably does not represent the winner of the Idol public. Why should we invest so much time next year in this show and then have to sit back and watch some special interest group take control of the vote and shove a bland idol down our throats. The only good thing I can think of comning out of a mess like this is to have discovered great talent like Adam Lampert and Allison. The true American Idol competiton is about to begin. and spooches says vote wasn't close Kris beat Adam. GOT MORE VOTES AND THAT IS ALL. Adam is not complaining,not blaming and Adam is supporting Kris Allen, his friend. Therefore, so do I and I genuinely think he is very talented. Congratulations to both our champions who both have millions of fans who love them. No wonder they like each other, must be nice guys. I just dont know what to think! I do know that Idol will never mean the same to me. At first when I heard this story I thought everyone was just being sore loosers. Now Im hearing more and more convincing details of this sad sad fraudulant voting scam. I really love American Idol and hope this is investigated because this would be the begining of the end of a great show. It was never about fairness. The talented kids with their back stories, the judges' antics, the false drama--all of it designed to increase advertisers' profits by driving up the ratings. At the end of Season 8, when it looked like AI's image (meaning next season's ratings) might suffer, AT&T paid a visit to Arkansas. Kris might have won without AT&T's meddling (those Gokey votes had to go somewhere), but we'll probably never know. What I'll choose to remember about Season 8 is Adam Lambert--his dazzling talent and beauty, the joy he brought us every week and how special it felt to be a part of that.